To get started, download the summary that highlights the key points of the toolkit. This toolkit is intended as a practical guide of helpful tips, but it is not exhaustive or meant to be used as a stand-alone training tool. This toolkit is meant for any individual who works with young children, including but not limited to: Early Childhood Educators, Child Care Providers (daycare), Home Visitors, Infant Development Practitioners, Indigenous Early Years Practitioners, Child Minders, Sunday School Teachers etc. Throughout this document the term “early years provider” will be used to refer to all professionals and/or helpers who work with children between the ages of 0-5 and their families. 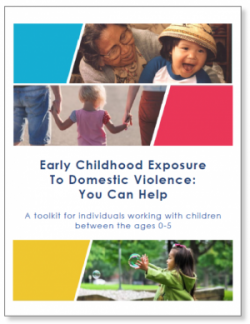 As part of the Provincial Domestic Violence Plan, MCFD committed to develop an Early Years Toolkit to increase the capacity and competency among early years professionals to respond to children who are exposed to domestic violence and provide their families with appropriate support. Following an initial academic partnership with the University of British Columbia, in which graduate students created an early draft of the toolkit, in late summer 2016, PODV partnered with MCFD’s Child Welfare Policy team and the Provincial Office of the Early Years to revise and enhance this toolkit. A working group with representation from the early years, anti-violence, and immigrant/settlement sector, and government delegates from the Ministries of Health, Education, Children and Family Development, and Delegated Aboriginal Agencies (DAAs) provided subject matter expertise and support to develop the content of the toolkit. There will be a pilot launch in the Fall of 2017 with an implementation strategy to be developed by the working group based on feedback received. Domestic violence is everyone’s problem. Globally, about 1 in 3 women report being abused by their intimate partners at some point in their life. According to Statistics Canada (2017), 1 in 10 Canadians have witnessed violence by a parent or guardian against another adult in their home before the age of 15. Around 70% of these child witnesses also reported being the victim of childhood physical and/or sexual abuse. Those who witnessed violence between their parents also reported experiencing the most severe forms of physical abuse. By working together we can reduce the impacts of domestic violence on children. A child who sees, hears or is aware of violence against one parent or guardian by another is being exposed to domestic violence. While not all children are affected in the same way by this exposure, there may be significant long-term impacts that can negatively affect these children’s physical, emotional, cognitive, behavioural and social development. It is not only exposure to domestic violence that can harm a child. They may be harmed by physical, sexual, emotional abuse or neglect. Any form of child abuse or neglect must be reported to the Ministry of Children and Family Development (MCFD) or a Delegated Aboriginal Agency (DAA). For more information see references below. When domestic violence is identified early, we can provide more effective interventions and supports for children and their families. Having supportive adults and stable environments in their lives can have a positive effect on children’s development, even if they are exposed to domestic violence. For this reason, individuals who work with children between the ages 0-5 are in a unique position to make a difference. Statistics Canada. (2011). Family violence in Canada: A statistical profile. Catalogue no. 85-224-X. World Health Organization (WHO). (2010). Preventing intimate partner violence and sexual violence against women: Taking action and generating evidence. World Health Organization. (2012). Understanding intimate partner violence and sexual violence against women: Intimate partner violence. World Health Organization (WHO). (2014). 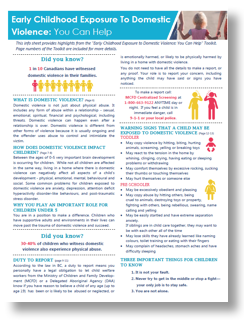 Violence against women factsheet. Government of British Columbia. (2015). A vision for a violence free BC. Government of British Columbia. (2014). 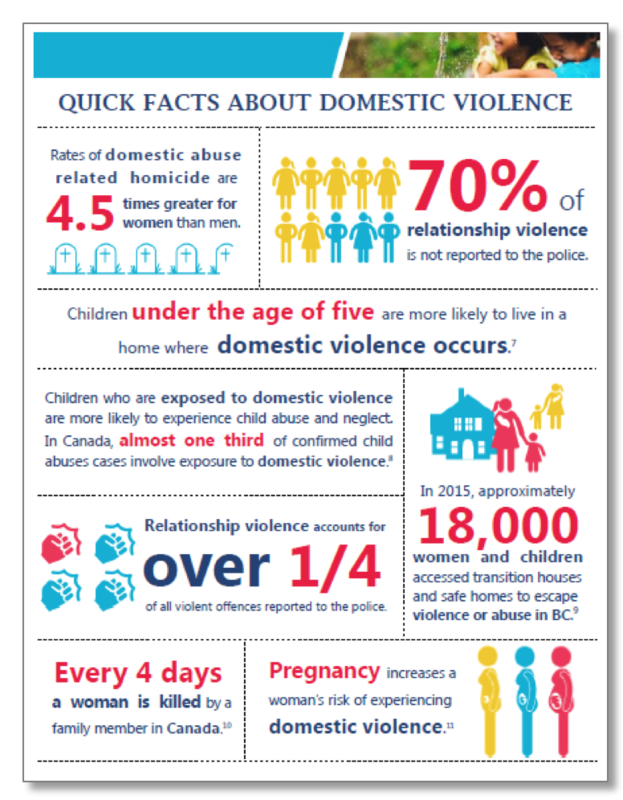 British Columbia’s Provincial Domestic Violence Plan. Schafran, L.H. (2014). Domestic violence, developing brains, and the lifespan: New knowledge from neuroscience. Judge’s Journal, 53(3), 32-36. Artz, S., Jackson, M. A., Rossiter, K. R., Nijdam-Jones, A., Géczy, I., & Porteous, S. (2014). A comprehensive review of the literature on the impact of exposure to intimate partner violence on children and youth. Schwartz, C., Waddell, B.J., Garland, O., Gray-Grant, D., & Nightingale, L. (2012). Intervening after intimate partner violence. Children’s Medical Health Research Quarterly, 6(4), 1-15.